The M3R carries a 5 star SHARP rating, which is nice and reassuring. I don’t know of any other helmets with 5 stars that come close price wise (the MT Revenge is possibly closest, selling for around £80-90). The M3R doesn’t have much in the way of fancy features, just three vents you can open or close, a double D strap and slot in chin/breath guards. Cheap (in Amazon sale, not normally though). 5 Star SHARP safety rating. Comfortable. Especially around the ears which aren’t overly squashed. Well vented. You get a lot of wind flow through this lid, which is great on hot days. Good build quality, including a thick strong visor. Visor has no sticking out handle to aid opening it with gloves on. There’s just a slight indent in helmet shell, but it’s doesn’t help much. No Pinlock visors available, no replacement visors available at all in fact. Probably due to the line being discontinued. Noise. 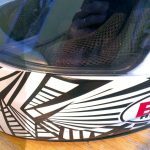 The helmet is very noisy, worse than my old AGV K4. Not helped by its extreme ventilation. Vents are very tricky to operate with gloves on, they’re stiff, too flush and don’t move much. Vents let quite a bit of water and dust through. In the rain with no Pinlock, steaming up is a big problem, but opening vents lets a spray of water through. Crap if you wear glasses. The breath guard just rams in between outer shell and inner foam. Tricky, but worse, it keeps getting nudged out as you carry the lid by the chin piece. Also, my visor seems to have a manufacturing problem, as it has big rainbow swirl in it, which can be a bit distracting in direct sunshine. Vents let in rain. Breath guard easily dislodged. 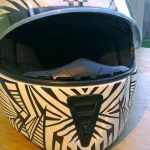 I know that might sound like a lot of gripes, but to be honest, many of these will be common with many cheap sub £100 helmets. The key thing here is this helmet cost me £44 and has a much better safety rating and reputation than the others. 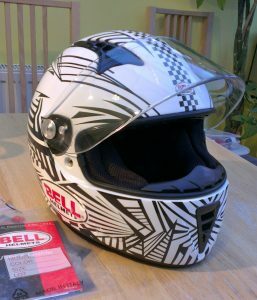 Hell, my wife even bought a £100 HJC lid without realising it had just a 1 star SHARP rating! 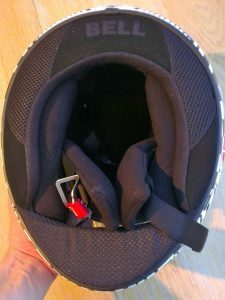 I can see myself upgrading to a better helmet (particularly for the winter due to lack of Pinlock), but as far as cheap stop gap measures go, it’s good helmet to go for. Unfortunately, Amazon no longer have them going cheap and many other places still with stock are charging a lot more, which makes the M3R a less attractive choice. Addendum: Amazon now have the Bell M3R back in stock for just £38! 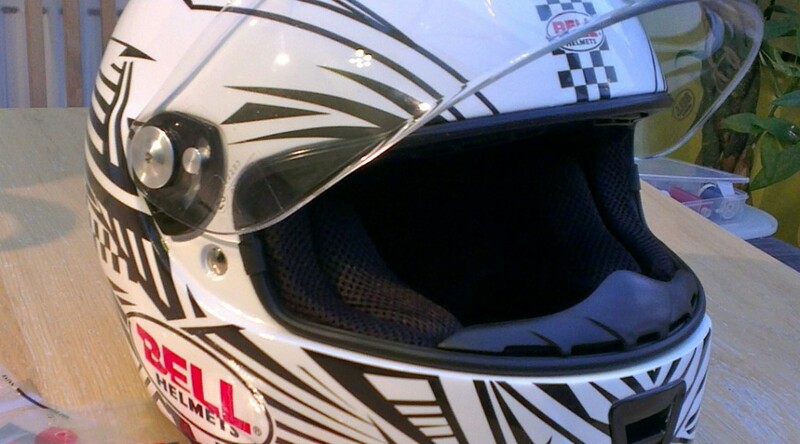 Along with many other Bell Helmets. Further addendum: Having used this helmet for the last few weeks of very wet weather and brisk mornings, I can now say the M3R is a rubbish helmet in the cold and wet. 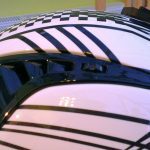 Fogging up is a huge issue, even when removing the lower neck guard and with the nose guard in place. At high speed, 50mph+ the open vents can clear the fogging, but you get a serious brain freeze and deafened by the whistling wind! You have to really ram the visor shut to get a good seal, otherwise water seeps in and up from the bottom of the visor. As soon as you crack you visor open (to clear fogging) a torrent of collected water runs down the inside of the visor from the top. Not that opening the visor is particularly easy with gloves on. Riding in the rain quickly turns into a cat’n’mouse game of fogging up vs water on the inside of the visor, and suffering terrible visibility either way.